Last night, we finally dined at L’Atelier inside MGM Grand. We had an 8:30 reservation; the restaurant was packed to the gills we had to wait to be seated. About ten minutes later we were led to our seats at the counter. We settled in and told our waiter we’d be having the summer menu. He offered wine or cocktails; we declined and opted for iced tea. We munched on the most delicious bread while we waited for our food voyage to begin. We also kept an eye on the dishes being created in front of us. Every plate that went out looked like a piece art. We began with an amuse bouche, a shot glass filled with a cucumber gelée topped with Crème fraîche and mint. It was fresh and crisp, a definite palate cleanser. Next was Les Legumes, buffalo mozzarella layered between zucchini and eggplant. The dish was very tasty; several flavors were unleashed with each bite. La Langoustine followed, a buttery langoustine and basil leaf coated with a perfectly light tempura served with a small salad, and basil pesto sauce decorated the plate. Frank and I had different selections for our main course. Frank had La Boeuf, Wagyu beef rib eye. The meat was prepared beautifully, it was tender and delectable. We longed for more. I had Le Saumon, Scottish salmon with tomato and capers and fried strips of potato. The salmon was fantastic. We both were given our own cast iron dish filled with pommes purée. The smooth rich mashed potatoes hit the spot. The next course was Les Fromages or a selection of cheeses and bread. There were three: a Roquefort blue cheese with great veining, a pungent cow’s milk cheese, and the third was our favorite, but the name escapes me. I am unable to recall what breads were served to complement the cheeses, as well. Lastly, we had Les Tartes and Glaces Et Sorbet for dessert. I started with the selection of tarts, six if I remember correctly. I thought all were delicious. Frank dug into the sorbets, five, I think. The chocolate was his favorite. We switched desserts. He liked the pecan tart the best. I finished the sorbet, the raspberry was my favorite. We concluded our meal with espresso. Dinner took about two hours start to finish. We did get a bit antsy by the end of the meal. However, we enjoyed the experience. It was different than were used to and the attention to detail is amazing: flavors and presentation. Service was excellent for the most part. Although, the wait on refills for our iced tea was a bit long on two occasions. Despite the special summer menu pricing, the meal still set us back about $200 ($30 on iced tea). We are glad we took advantage of the offer, the food was fabulous, and it was a nice treat. Frank had another Fantasy Draft last night. 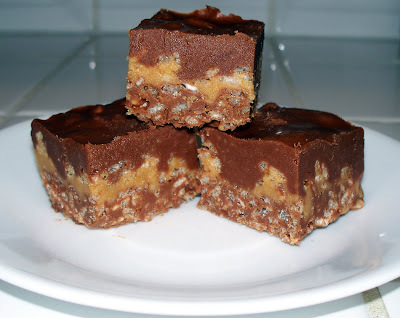 That gave me a chance to try another recipe I've been drooling over since I saw it on Cookie Madness, Peanut Butter Fudge Crunch Bars. Delicious. Rich. And, Oh, so tasty. 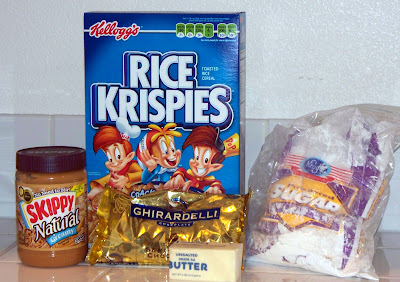 A couple weeks ago, I came across a blog called Cookie Madness. I’ve been inspired by her dedication to bake a new treat each day. I figure if she can bake daily, I can at least give it a try every now and then. Frank had his first fantasy football draft last night. 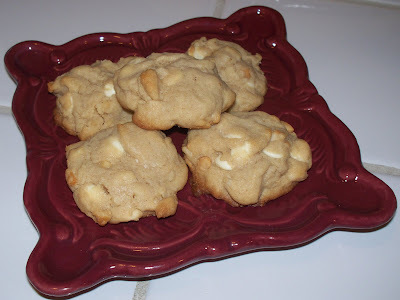 That left me with plenty of time to try one of Anna’s tried and true recipes, White Chocolate Chip Macadamia Cookies. The dough came together very quickly. About 15 minutes later, 10 minutes to bake and a few more to cool. Easy recipe. Tasty cookie. Although, Frank thought it was on the salty side. 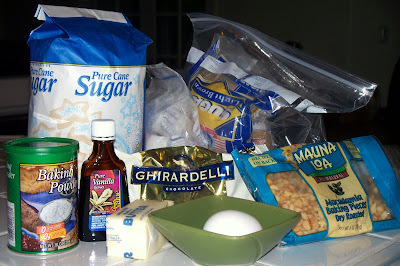 Anna recommended lightly salted macadamia nuts on her blog, but I failed to make note of it. 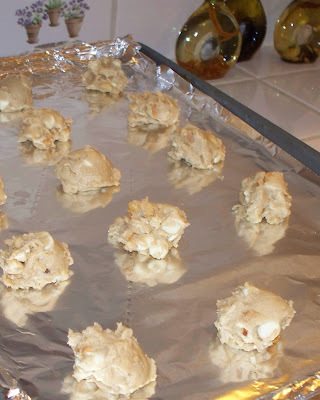 Had I used lightly salted nuts, I think the cookies would have been perfect blend of salty and sweet. First off, our home is ours once again. Wonderful to have quiet and privacy back. I followed up with my doctor on Saturday, aside from my blood pressure I am as healthy as can be. My blood pressure readings over the week were high, but not consistently high enough to be put on medication. Instead, I’ll be monitored for the next six months to a year. We’ll take it from there. Saturday, I also had an eye exam. Thankfully, my eyes have not worsened over the last twelve or so years, I’m still a little near-sighted and I have astigmatism. I picked out frames; my glasses will be ready next week. I opted to get used to my prescription before jumping into contact lenses. I’ll give those a shot later down the road. Additionally, on this visit, I had my eyes dilated for the first time. Good news is that my eyes are extremely healthy. Bad news is my eyes are extremely sensitive to dilation. It was one day I wished I lived where it was dark and cloudy; instead I walked out into the bright afternoon sun without a cloud in the sky. Fortunately, my house is less than two blocks away from the eye doctor’s office. I made it home safely, although, pulling into my garage was quite a challenge. I managed okay, until I walked into the house… Suddenly my kitchen was lit to what seemed to be the equivalent of the Luxor beam. Why, oh why, did I insist on having a home with plenty of natural light? I holed myself up in the bedroom with the doors closed and blinds drawn until the sun went down. I kept occupied by flipping between Food Network and HGTV. I was useless for the rest of the day, Frank made us dinner and I wasted away in bed. I was relieved when I woke on Sunday seeing clearly and I was able to tolerate light once again. Frank destroyed a couple pairs of shorts last weekend so we hit Target for replacements. Not only did we buy shorts, but we also picked up a 47” LCD Philips TV. It was an unexpected find. Last time we checked they didn't even carry any TV's that offered 1080p. We’ve been shopping around for months and this deal was too good to pass up. We threw it in my trunk and headed home. It’s set up, but we still need to purchase a wall mount for it. Then, we will be all set, just in time to kick off football season. Can’t believe I have a three-day weekend coming up for Labor Day. Summer is nearly over, where does time go? Although, it will be nice to have an extra day with Frank. August is fading away quick so we’re running out of time to take advantage of L’Atelier’s summer menu. I’m going to see if we can get reservations for tomorrow night. More tasty eats are on the horizon since restaurant week is September 1 – 7. I have a short list of places to try. I’m looking forward to that, as well. Last Friday Frank made it to Phoenix in the Jimmy without incident. We were both amazed considering its track record (caught fire on the way to Laughlin, leaked anti-freeze on the way to Calico, etc). Although, it was a long 6+ hour ride for Frank, the A/C wasn’t working, the truck doesn’t go over 65mph and it gets about 10mpg. Frank and Shane got started on the modifications Saturday morning. They worked on the truck from 5am to midnight each day through Tuesday. When I talked to Frank on Monday he said as long as the rims they had special order arrived on Tuesday he’d make it back home late Tuesday evening as planned, and wouldn’t need the flight I booked for him a few weeks back (thinking they might not finish before he had to be back to work). Tuesday all the parts they needed arrived. They got everything installed and took the truck to a repair shop because it started leaking trans fluid shortly after Frank arrived on Friday. The transmission itself looked good, only a seal needed to be repaired. That was done and they went back to Shane’s. There was one last alteration that needed, since they had time, they decided to go ahead and get it done. It turned into a bigger project than they originally thought. Frank decided that he’d stay Tuesday night get a goodnight’s rest and hit the road at 5am and head into work late. He left before sun up as planned, all was going well until he was about 5 miles outside Wikieup, AZ. The Jimmy was leaking trans fluid again. He pulled over and called me while I was in the hospital waiting to get my blood taken. I told him to try to get to Wikieup and find a repair shop there, and that I’d come get him if needed. He called me when he got to town, but there was no place open to help him. He was able to get the number for a tow at the Shell. It cost $250 for the ride to Kingman. Luckily, there was a transmission shop there that could get the truck fixed that day. Again, the transmission looked fine, they determined that the trans was overheating. They believed that the combination of the modifications, heat, and mountains were putting to much strain on it. They put an external cooler on the trans, an hour and $200 later, Frank was back on the road. I was relieved. By this time Frank called off work, and he planned to spend the rest of the day in the pool, resting his sore and tired body. He was about 45 miles from the Hoover Dam when the trans began to overheat once again. He called to update me, I suggested he go slow and try to get as close to home as possible, because the tow would surely cost less. He proceeded slowly, getting about 8mpg now, at least the air works. I didn’t hear from him for a couple hours so I thought he finally made it. He came close, he called again from the side of the 215 just shy of the Tropicana exit, a couple short miles from home, and less than a mile from our repair shop. Figures, right? He was a bit shaken up, he was cruising along, until he smelled gas, and his gauge dropped from half a tank to empty. He pulled over, jumped out and ran away, anticipating it to blow. Fortunately, it did not. We assessed the situation, while letting the truck cool down. I asked if any fluids were leaking or if he still smelled gas, both were negative. So, we felt circumstances were safe enough for him to push it the last mile to the repair shop. Luckily, he made it in one piece. And so did the Jimmy. The shop owner gave Frank a ride home. He was beat and disgusted. After the long hours, hard work, blood and sweat that went into fixing the Jimmy, it found itself back into the repair shop. I felt for him I really did. I came home from work to find him sleeping in the pool. It was nice to have him back home, I missed him. I can’t wait to see all the work they did, once the Jimmy makes it back home. We’re also stoked to get the beast out to the desert to see all that it can do. Last night, the in-laws, and I had dinner with Frank’s uncle Phil, cousin Lauren, and her boyfriend George. We dined at Café Heidelberg. It is likely the most authentic German restaurant Vegas has to offer. One woman, Ana, waits on the tables then the rest of the family cooks in back. There's also a small store attached which sells German goodies. There were four Wienerschnitizels ordered, Frank's dad had a farmers platter which offered a sampling of sausages, and I had Jaegerschnitizel. My dish is basically a pork cutlet smothered in a mushroom wine sauce with onion, I had cucumber salad and spaetzle for my sides and I started the meal with marble rye and Bavarian potato soup. For dessert, we had apple strudel with vanilla sauce. There was plenty of grub to go around and everyone thought the meal was good, but service was slow and became non-existent as the restaurant filled. Ana apologized profusely, but service continued to suffer. Dinner took over two hours. It’s definitely not a place to visit if you're in any type of hurry. Otherwise, it's a good choice for German cuisine. I thought the food was far better than at Hofbräuhaus, also the atmosphere is far more relaxed and quaint. They offer a large beer selection as well. I sampled Spaten lager and a Spaten Optimator. Both were quite good. Next time I get the hankering for German food I wouldn’t hesitate to return, I’d just hope to catch them on a less busy night. Side note: Phil and I both had Entertainment Cards, which allow you to get one entrée free with the purchase of another. We were able to use both on the same check. I thought that was nice. A new In-N-Out location! I haven’t decided if this is a good thing or a bad thing. See, it’s within walking distance of the house. We’ll pass it everyday coming and going. It’ll be way too convenient to grab a double double and fries. I’ll just have to try to be good and only indulge on occasion. It broke ground in the last week, it’ll be interesting to see how long it takes before it opens. In any case, I look forward to grabbing a bite there. Judy’s service was very touching, her husband and daughter gave eulogies that really tugged at our heart strings. I don’t think there was a dry eye among us. Afterwards, we had lunch at Green Valley Ranch’s buffet. GVR was Judy’s favorite casino; an afternoon of max bet penny slots brought her great joy, and more times than not, good fortune. She was also an avid golfer and bowler. She will be missed. I’ve noticed that it’s getting dark much earlier these days. It serves as a reminder that fall is right around the corner. Perfect temperatures are near. The last few years we’ve traveled to Mexico in December to escape the chill for a week, but a trip this year doesn’t look too promising. Originally airfare was sky high, but it has come down quite a bit recently. However, it doesn’t look like we can spare the expense unless the condo miraculously sells. Start of football is around the corner. Ahh, lazy Sunday’s in front of the tube. It looks like I’ll be trying my luck and skill in a couple fantasy leagues this year. That should be fun. Frank’s off to Phoenix for the weekend, he’s due back Tuesday. Meanwhile, I’ll be hanging at the house with his parents. Sunday, we’ll visit my mom. This morning I decided to put an end to my procrastination and I made doctor appointments. I’ll go tomorrow for a long over due check up. About a year ago, I was instructed to have my blood pressure monitored. I’m terrible; I’ve neglected to do so, until now. Then, next Saturday I have an eye exam. My eyes haven’t been checked since I was fifteen. Back then, I was told I have astigmatism and my sight was less than perfect. I tried contacts, but I couldn’t get the damn things in my eyes. I recall having several fittings because my eyes would swell shut from trying to jab the contacts into my eyes. Needless to say, they were a complete waste. After a week of trying at home I gave up for good. Hopefully, I’ll have better luck or more patience this time around. I think that's about it. Have a great weekend! I love Chinese food, but I’ve been deprived of the familiar flavors of the style served up in Chicago ever since I moved to the desert. I’m still not clear what style that it is, I was led to believe it was Cantonese, but when trying Cantonese style restaurants in Vegas, I was disappointed when the dishes varied from those I was accustomed to. I’ve tried everything from the authentic-chickens hanging from the ceiling-hole in the wall place in Chinatown to the trendy Americanized P.F. Changs, to the high-end Shanghai Lily inside Mandalay Bay. And another dozen places or so places in between, none have satisfied my craving. I’ve had to rely on visits back to Chicago to fill the void. That is until I was introduced to the Chinese menu at the Victorian Room inside Bill’s Gamblin’ Hall. Frank had lunch there a couple weeks ago and he was thoroughly impressed by their offerings. He said the egg roll was actually reminiscent of the kind we’d find back in Chicago, instead of the common spring roll. See, to us spring rolls and egg rolls are two different beasts, but most places seem to think they are one in the same. The egg roll I know and love is filled with ground pork, shrimp, cabbage and other tasty bites. They’re fairly large and filling. The outside is crisp and covered in bubbles. It’s best served with sweet and sour sauce (orange and thick, not red and runny) or Chinese mustard. Spring rolls, on the other hand, are small and filled with veggies. They have a crisp flaky pastry-like wrapper. Friday night, Frank and I started with won ton soup ($8.99). Fresh and tasty. We split and egg roll, it had shrimp inside it was pretty good, but it still wasn’t up to par ($8.99). He tried the sweet and sour chicken ($19.99), which was decent, but it was laden with the red runny sweet and sour sauce so commonly found. I went with shrimp fried rice ($9.99). The only misstep with this dish is that it was made with peas, otherwise it was served just the way I like it, with dark rice, eggs, bean sprouts and carrots. I was in heaven. The shrimp were large and cooked to perfection. I couldn’t have been happier. I stuffed myself silly trying to consume every morsel. It was that good. The dinner menu is on the pricey side, but the fried rice must be one of the better values. My mouth is already watering at the thought of it, I must get back there soon. Yesterday, my mother-in-law called to let us know that Frank’s aunt Judy was in her final stage of Alzheimer’s. She was in ICU, unable to swallow; her doctor thought she had about ten days left. Turns out, she only had hours; she passed away last night at 9:20. She was in her fifties so it’s sad to see the disease take her so young. However, I wouldn’t wish the life she was left with on anyone. It’s comforting to know she’s now in peace. Her memorial will be held on Tuesday. The In-laws will be flying in on Sunday or Monday and they’ll stay with us for a couple weeks. I’ve decided to postpone my vacation. I’m not sure if Frank can make alternate plans, I do know he can’t reschedule his trip to Phoenix next weekend. So, he’ll keep those plans and I’ll stay home with his parents. Looks like L’Atelier will have to wait, as well. Check out Cake Wrecks, it's a fun blog that has brought me many smiles and I've even broke into tears from laughing so hard. Frank sings this to me all the time because he knows it irritates me. Time is not on my side, it's always in slow motion or fast forward. It's never at the rate I want it to be. Workdays often limp by, but weekends fly. After 21, years pass in the blink of an eye. All proof that time is not on my side. It’s only Tuesday and the week is already dragging. Frank and I are taking vacation next week. The anticipation of spending a week by the pool and the freedom to do whatever, whenever is taking its toll. I think this week might be longest ever, at least it feels that way. The only plans for next week are dinner at L’Atelier to take advantage of their summer menu, and then Friday, Frank will head to Phoenix in the Jimmy. His friend Shane is a mechanic; they will be replacing parts on the Jimmy and making modifications. When it’s done it will be one helluva rock crawling machine. We wanted to get all the work done before fall so we can go out and play as soon as the temperatures cool down. I opted not to make the trip. I’ll stay home and get things done around the house instead. Then, I got news that made the condo ordeal not matter so much. Saturday my sister mentioned to me that my grandpa has ear cancer. He was diagnosed in November while my grandma was in hospice. His cancer is terminal; he was given six months to a year. For whatever reason, word was never shared. Amy found out this week, when he started hospice treatments. He has lost his short term memory, but I asked Amy to send my love and tell him I was thinking of him, anyway. It seems he’s already on borrowed time so I doubt it’ll be long. Sometimes we get so wrapped up in day-to-day, we forget the big picture and we sweat the small stuff. In the scheme of things, the condo issues are nothing to be concerned by. It’s only money. We have our health, happiness, love and support. I’m forever thankful to have what matters most. We ate at BLT Burger on Friday night. The restaurant was busy, but we were seated right away. We sat in a booth along the wall, the people watching was great, the booth was squishy and not very comfortable. Service was odd. Normally, when a party of two sits at table set up for four they remove the extra settings, not here. Order was taken promptly. Refills were slow. A manager came by and asked how everything was we said we watched 20 members of the staff pass by and no one offered to refill our empty glasses. She left mine and walked away with Frank's glass. About two minutes later our waiter returned with refills. Thankfully for the both of us. For a moment I wondered if they'd only return with one. For our meal, we started with waffle bites ($7). Tasty, it left us wanting more. Frank had the BLT burger with swiss ($15) and I opted for the Classic burger with swiss ($14), we also shared an order of sweet potato fries ($5). The fries were great, the beef was good, but the buns killed the burgers. They were dry and too much bread for the 7oz patty. I finished up my burger and the bus boy was all over my stuff immediately. My drink was about 1/3 full and he asked if I'd like a refill. I said no. He snatched my glass away. Just because I didn't want a refill, doesn't mean I don't want to finish my drink. I was a bit annoyed... and thirsty. Needless to say, BLT Burger did not impress us. I'd rank it with Burger Bar, that's another gourmet burger joint that didn't thrill me. Fortunately, they have a walk up counter for their shakes. We will go back to try one at some point. Those looked delicious.